Special Report: Say It! Hear It! - The Power of Effective Communications from Ready2Go Marketing Solutions, Inc. Whether you are talking to your spouse, boss, co-worker, or your child, you need to get your message across to them. You need to be heard, but just as important, you need to hear. 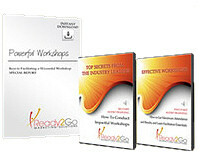 Are You Ready to Learn How to Communicate With Power and Influence? How you communicate has a direct impact on your career, your family life and your relationships. In fact there is nothing in human relations that you do more than communicate. Special Report on How to Communicate With Power and Influence. What is 5 times more effective in getting your message across than the words you are speaking. What will make the hearer disbelieve you, even if you are telling the truth! What makes up 55% of the message your listener receives, and it has nothing to do with the words you choose. What role your voice plays in communicating. How to control your voice to become a powerful communicator. That is the first half. The other half goes into what makes people seem charming, polite and unforgettable. And, what will make you charming, polite and unforgettable to others! The second half discusses The Art of Listening. Why you will be more effective in your communication if you talk less. Techniques to avoid misunderstanding and make the other person feel that you really understand them. What clues to look for while you are listening to see how the person you are speaking with really feels. How to actively listen and still get your message across! Once your clients learns the techniques and the knowledge of communication in this article, they will have a clear understanding of what they can do to become a champion communicator!